The dedicated trade show for architecture professionals is coming to Madrid for the first time and promises to be a resounding success! Since it first started, the show has been organised in more than 10 countries and is known for its relaxed yet professional atmosphere, making it the perfect backdrop for creating and maintaining business relations with other professionals in the architectural sector. The Architect@Work show is notable for its exclusive approach and carefully curated range of products and exhibitors, which are approved in advance by a prestigious panel of highly experienced architects. The usual aisles of a conventional trade fair are transformed into the areas of a lounge: places where people can relax over a drink, have a chat and broaden their knowledge of products, applications and innovative services. Spain has always been in the sights of Architect@Work. Last year it was held for the first time in Barcelona and the next edition will be a first for Madrid. 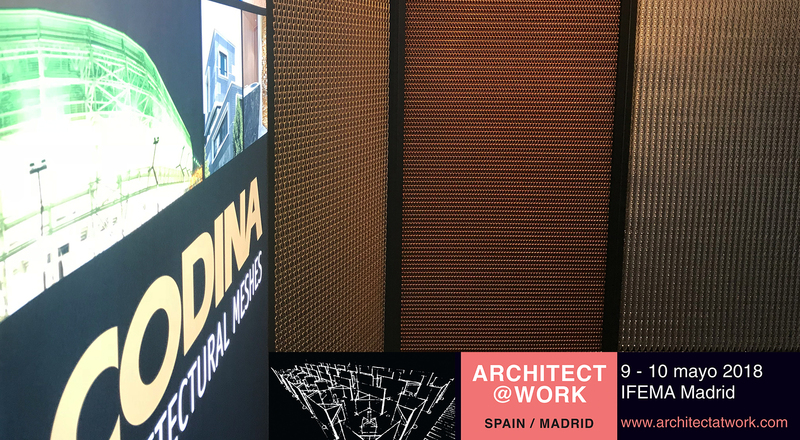 Codina would like to let you know that after taking part in the Barcelona show last year we will be back again at this consummate trade show opening in Madrid, showcasing all our new products and innovations. This time we will be exclusively presenting the Mies model in copper with an engraved strap and the Eiffel model in copper anodized aluminium. We do hope you’ll like our new products! We would love to meet you, so please feel free to come along to Stand 91. The show’s opening times are 1:00 pm to 8:00 pm on Wednesday 9 and Thursday 10 May. Fancy paying us a visit? Sign up here with just one click! Nous vous informons que votre email sera ajouté à la liste dont BANDAS METALICAS CODINA, S.L. est titulaire pour vous informer de nos nouvelles. Consultez notre Politique de privacité pour savoir comment nous allons gérer les données que vous nous fournissez et les droits que vous conférént les lois actuelles.